The audio output from a standart notebook or netbook with built-in speakers is low and the quality is also low. Alternatively, you can use a earphones to make good quality audio output, but for some people, earphones is unconfortable for them. A power amplifier is needed to achieve a high volume. The following diagram is a simple circuit to amplify the notebook’s audio output. The circuit is very simple and inexpensive, it use power amplifier IC LA4440 (IC1) and a few other components. LA4440 is a dual channel audio power amplifier, so you just need an IC for stereo application. It has low distortion over a wide range of low to high frequencies with good channel separation. Inbuilt dual channels enable it for stereo and bridge amplifier applications. 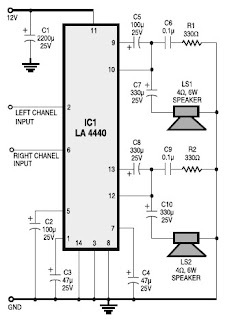 In dual mode LA4440 gives 6 watts per channel and in bridge mode 19- watt output. It has ripple rejection of 46 dB. The audio effect can be realized by using two 6-watt speakers. Connect pins 2, 6 and ground of IC1 to the stereo jack which is to be used with the notebook. Assemble the circuit on a general-purpose PCB and enclose in a proper case. The circuit is recommended to be powered using regulated 12V power supply to minimalize the noise or "hum" sound. It is recommended to use audio input socket in the circuit board. Mount the LA4440 on heatsink to prevent overheating on IC.